The kagu is listed as Endangered, facing a very high risk of extinction, under the U.S. Endangered Species Act and on the Red List of the World Conservation Union (IUCN). The rehabilitation of the kagu is one of conservation's better success stories, although the birds are still listed as Endangered. That kagus still survive and have even increased their numbers since 1980 is largely due to the efforts of one man, Yves Letocart, a New Caledonian citizen, who has been working with kagus and their environment since 1980. 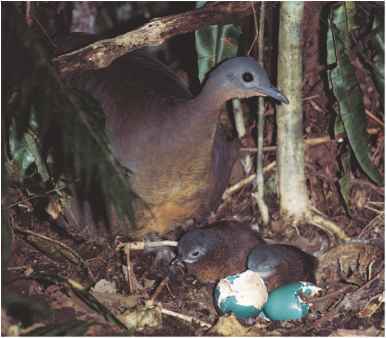 Much of what we know about kagu behavior comes from Letocart's field work. Today, as a result of Letocart's field work, captive breeding and release of young birds, and predator control, an estimated 300 kagus inhabit Blue River Park, which has been classified and proclaimed a territorial park by the governments of New Caledonia and France. The kagu is now the official emblem of New Caledonia. Most important for the survival of the kagu is protecting it in areas made inaccessible to invasive animals by trapping, shooting, and the use of fencing; increasing the kagu's numbers through captive breeding; and creating forest "corridors" that allow isolated populations to intermingle.